This tutorial demonstrates how to create custom materials using shaders in CopperLicht. Create a .html file and paste this code into there, place the copperlicht.js file from the CopperLicht SDK in the same directory, and add two .jpg files named crate_wood.jpg and stars.jpg which are used in this example as textures. Of course, we need a camera from which the 3d scene is rendered. We place it at 20, 15 and add an animator to it so that we can move the camera using the cursor keys and the mouse. 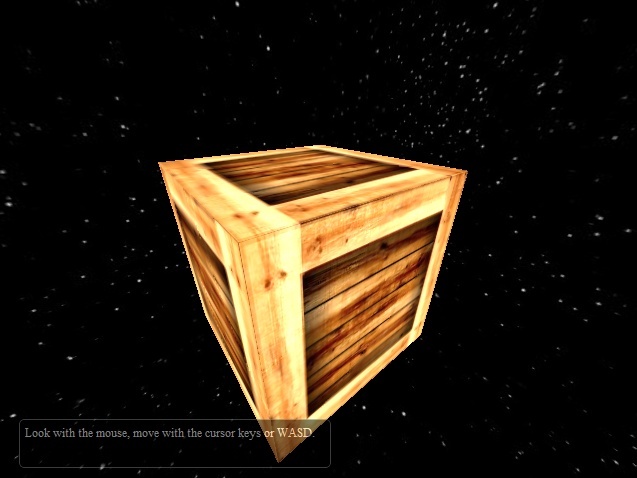 In addition, we also add a simple sky box and a cube scene node in the middle of the scene. The material of that cube will then later have the material we create. Note that the vertex_shader program is using some constants like worldviewproj, which is the World-View-Projection matrix. This is a variable provided by CopperLicht. If you want to set own variables, you can do this using the normal WebGL functions, and the Renderer.getGLProgramFromMaterialType() function. The program multiplies the current vertx position (vPosition) with this World-View-Projection matrix to store the final vertex position into gl_Position. This is what basically all vertex programs should do. Also, it saves the texture coordinates (vTexCoord1.st and vTexCoord2.st) so it can be used in the fragment shader below. The fragment shader, the program which writes the pixels is accessing the texture coordinate using texture2D and writing it out to the screen, gl_FragColor. Before this, it is multiplying the color by two, making it brighter. Feel free to change the * 2 statement to something different to try it out. If you don't understand all this, don't worry. Writing GLSL shaders is quite complicated and there are books and tutorials out there covering this, but it is out of the scope of this tutorial explaining in detail how they work. And that's it, now you know how to create own materials in CopperLicht. This is not all of course. You can specify blend modes for transparent materials for example using the further parameters of createMaterialType, and you could set shader constants during runtime, but basically this is it. If you are interested in modifying shader variables at runtime, take a look at the CL3D.Renderer.OnChangeMaterial callback.